Tom and Carla and their two children live in a 2-bedroom apartment that costs $1,200 per month. Carla stays home with their baby and pre-school child. That leaves them $533 for food, transportation, child care, clothing, utilities, and phone. There is no extra money for emergencies. They may be eligible for food stamps ($299), Woman, Infants and Children services, Earned income tax credit, NJ Family Care, and Utility assistance. Juan is a single 46 year old man who has been homeless for years. He may be eligible for food stamps ($162), welfare ($140), Medicaid, and workforce training. Susan is a single mother with a pre-schooler and a school-aged child. She lives in a two-bedroom apartment that she rents for $1,000 a month. She works full-time earning $12/hr or $2,080 a month ($24,960 annually). Her child care expenses are $242/month for her school-aged child and $700/month for her pre-schooler. She is left with $138 for any other expenses. She can either put food on the table for the night or put gas in the car so she can get to work. They may be eligible for Woman, Infants and Children services, Earned income tax credit, NJ Family Care, and Utility assistance. Maria is a single mother working two jobs to take care of her 3 children. She is making $35,000 a year, but can not afford to buy school clothes or supplies. She considers herself lucky that she lives in a house, but has not been able to make her $1,570 mortgage payments on time. Every year her mortgage, taxes, and utilities have gone up, but not her salary. Her youngest still attends day-care in order for her to work. This costs $242 per month. This year with the increased cost of gas for her car, and food, she can’t even give her kids lunch money. Sarah is a single mother of a 2 year old. She currently stays in transitional housing and receives TANF/Temporary Assistance for Needy Families, a total $322 on a monthly basis for herself and her son. Being a welfare recipient; she is required to participate in a work activity; she also has to pay a reduced child care cost of $200 per month. After these costs, she has $112 to last her the entire month. She is eligible for Food stamps, Woman, Infants and Children services, Earned income tax credit, NJ Family Care, and Utility assistance. Jason is a single 20-year old who is living on his own working at a McDonald’s fast food restaurant in Mercer County earning $7.15 per hour or $1239 per month ($14,872 annually.) He rents a studio in Mercer County for $850 a month. Jason is trying to take classes to get his GED and has to spend money at a local community college for training classes at $100 per class. Jason struggles to eat at night, and to put gas in his car to get to school and work or to pay for classes to further his life. His parents are not able to assist him. What is the Real Cost of Living in Mercer County Today? How much do I have to make to afford a two-bedroom apartment in Mercer County? If you pay 30% of your income for rent, as most banks recommend, you need $44,800 a year to pay the $1,120 Fair Market Rent for a two bedroom apartment. That’s $3,733 a month or $862 per week. This assumes that 70% of your income is adequate to cover all other expenses. It makes no allowance for family size or composition. To support a family of three (the average family size in NJ) with a single parent, a pre-schooler and a school-age child you would need $58,758 according to Legal Services of New Jersey’s Poverty Research Institute. We assume this family composition, since it is more typical of our population of homeless and potentially homeless people. It costs less when the children are older because there are no child care costs. 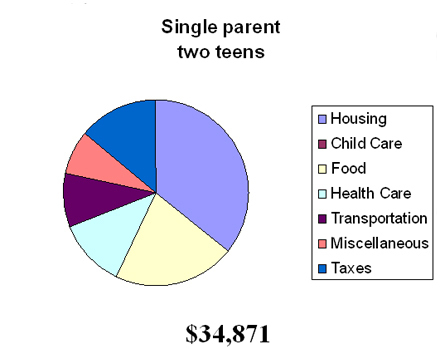 For a single parent of two teens the real cost of living is $34,871. What goes into the cost of living? The cost of living includes Housing, Child Care, Food, Health Care, Transportation, Miscellaneous (including clothing) and Taxes. The Real Cost of Living is the cost to cover the bare essentials. It covers local telephone service, but does not provide for entertainment or vacation; it does not cover debt repayment or savings to buy a car. It does not even cover school supplies. How do we decide who is poor? Poverty is measured in several ways, none of them approaching the real cost of living. Minimum wage ($7.15/hr) workers earn $15,096. 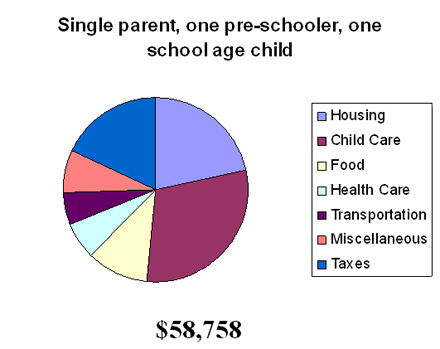 The 2006 US Census poverty level for two children and one adult is $16,242. 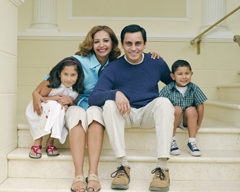 The Health and Human Services Federal Poverty Level (FPL) for a family of three is $17,172. Both are nationwide figures. At the county level 30% of the Area Median Income (from the Census) is considered Extremely Low Income. For Mercer County this figure is $23,052. 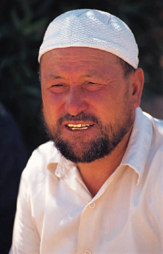 By any measure, poverty is widespread. In Mercer County 20% of Mercer households live on less than $25,000. Percentages of the AMI are used to determine eligibility for affordable housing programs. 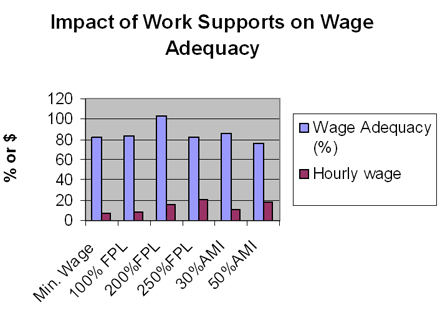 Multiples of the FPL are used as criteria by several work support programs. What about anti-poverty programs to help the poor financially? At some income levels, anti-poverty programs can bring down the cost of living so that families are closer to the break-even point. There are two kinds: tax credits and work supports. 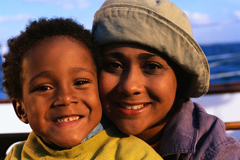 Tax credits include the child tax credit, the child care tax credit and the earned income tax credit (EITC). Unlike work supports, these are paid annually at tax time. At most, $1750 of the anticipated EITC can be paid throughout the year in one’s paycheck. Work supports are discounts on necessary expenses and are awarded according to income and availability. For example, NJ Cares for Kids Child Care pays some of the cost of child care. 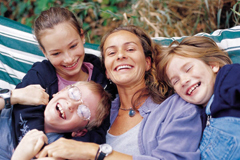 NJ Family Care offers reduced rate health insurance. The other work supports include Medicaid, Food Stamps, Women, Infants and Children nutritional program (WIC) and affordable housing. 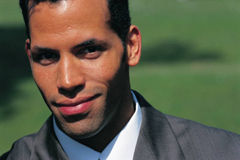 Even if an applicant qualifies, the benefit may not be available. For example, only 1 in 4 households that qualify for affordable housing actually have it. The impact of work supports can be enough to enable our hypothetical family of three to meet all of its expenses, but this is not always the case. What can we do about the problem of poverty? 1. Raise the minimum wage from $7.15/hr.and index the minimum wage to inflation. Research shows that the real cost of living is $12.11/hr for a single adult. 2. Increase the threshold for paying the state income tax. New Jersey families owe income tax if they earn over $20,000 a year. Increasing that threshold to $30,000 would help those families advance. 3. Revisit the state income tax cuts of 1994-96 that deprive New Jersey of much needed revenue and worsen the impact of a state and local tax system that requires low and middle income families to pay a higher percentage of their income in taxes than the wealthiest households pay. 4. Raise the welfare grant by 20%. It has not been raised in over 20 years. 5. Promote the Earned Income Tax Credit. The IRS estimates that 10-20% of eligible workers don’t receive it. 1 National Low Income Housing Coalition, Out of Reach 2008. This is based on the Fair Market Rent for the county as determined by HUD in the fall of 2007. 2 Legal Services of New Jersey’s Poverty Research Institute published “The Real Cost of Living in 2008: The Self-Sufficiency Standard for New Jersey” in April.